Author’s Note: This article arises from work by Eric Olson, member of the Greater Seattle Aquarium Society, and founder of the web site “The Krib”. It is a summary, analysis, and interpretation of data compiled by Eric and presented in his article Lighting Level: What’s ideal?, which is located at the web site address http://www.thekrib.com/Plants/Tech/Lighting/. In the last decade there has been a move in the North American aquarium hobby to create display aquaria with considerably lusher, thicker, more vibrant plant growth than was ever seen before. This movement followed a similar trend in northwestern Europe in the previous decade, and resulted largely from the publication of the English language edition of the book The Optimum Aquarium in 1986 . A fundamental aspect of this change is the move to much higher aquarium lighting levels than were previously seen. Debate continues as to what is the optimal light level for aquatic plant growth. To help answer this question, Eric Olson conducted an Internet survey of freshwater plant enthusiasts in 1998 . He asked each hobbyist how much lighting and of which type was being supplied to his or her planted aquaria. He also examined publications by Amano and extracted light level information from them. Amano is a professional aquarist who has developed and published methods for establishing “natural” aquaria based on scientific methods . For the purposes of his discussion, Eric considered the light producing efficiency of all fluorescent lights to be approximately equal and directly proportional to their wattage (which is approximately true); metal halide lighting to be equal to fluorescent lighting in efficiency (again approximately true); and incandescent lighting to have 1/4 the efficiency of fluorescent lighting (this is probably somewhat pessimistic). 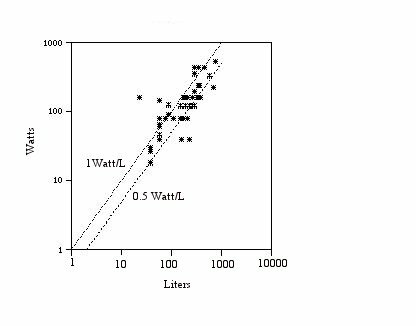 The results are plotted in figures one and two, where the wattage of fluorescent/metal halide lighting is plotted as a function of tank capacity for Amano’s tanks (Figure 1) and for Internet hobbyists’ tanks (Figure 2). Eric finds that the commonly used “watts per unit tank volume” rules do not apply well to tanks set up by Amano. 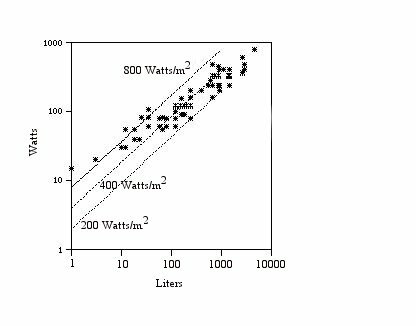 Instead, he shows that Amano’s tanks are better described by a parameter that he calls “watts per estimated surface area”, where estimated surface area is tank volume to the 2/3 power. He uses this parameter since the actual surface areas of the tanks were not always provided. The lighting in Amano’s tanks is found to be reasonably well bounded by this parameter within the range of 200W/m2 to 800 W/m2. The low, medium, and high range of lighting levels of “Amano style” tanks are shown in table 1. Let’s compare these results to my own aquarium. It was constructed to the imperial measurements of 48″ long X 24″ high X 24″ wide. The volume of the tank is therefore 453 liters (or 0.453 m3). Volume to the 2/3 power is therefore 0.590 m2. The tank is illuminated by 300 watts of fluorescent lighting, so the “watts per estimated surface area” value for my tank is 509 W/m2, or just slightly more than average for an Amano tank. However, the actual surface area is 0.743 m2, not 0.590 m2 as per the Olson estimate. The number of watts per actual surface area value of my tank is therefore only 403 W/m2. But even this corrected value is about average when compared to the Amano tanks. Wattages Required To Obtain Lighting Levels (in Watts per Estimated Surface Area) for Amano’s Tanks of Various Capacities (compiled by Olson ). Another example is my plant filter, which measures 40″ long X 12″ high X 22″ wide. It is illuminated by 220 watts (fluorescent). Its watts per estimated surface area value is therefore 708 W/m2, and its watts per actual surface area value is 388 W/m2. Again, we see that I am about average when compared to the Amano tanks. But how do commercial aquarium hoods compare to an Amano tank? Very poorly as it turns out. This comes as no surprise to anyone who has tried to grow plants under commercial aquarium hoods, but it is still quite surprising by how far they come up short. For example, the typical hood for a 36″ long X 18″ high X 12″ wide (127 liter) tank holds a single 20-watt fluorescent bulb. This results in a watts per estimated surface area value of 79 W/m2, and a watts per actual surface area value of 72 W/m2, or about 1/3 of the low end of Amano’s tanks. The hobbyist’s who responded to Eric’s Internet survey do however seem to set things up a little differently. As was noticed by Ronald Wozniak  in the Internet discussion that followed the publication of Eric’s article, the survey shows that the responding hobbyists set up tanks with a fairly linear relationship between light wattage and tank volume; as opposed to the “tank volume to the 2/3 power” relationship of Amano’s tanks. Most Internet hobbyists use between 0.5 W/L and 1.0 W/L. The range is however fairly broad, with some successful hobbyists having more than 2 W/L, while others as low as 0.25 W/L. In comparison, my own plant tank has 0.66 W/L and its filter has 0.79 W/L, both of which fit nicely in the middle of the range. The 20-Watt commercial hood for the 36″ long X 18″ high X 12″ wide tank would yield only 0.16 W/L, or again about 1/3 of the lower end of the range. It is probable that the hobbyist’s tendency to follow a linear “watts per unit volume” rule is completely artificial: they follow that rule simply because they were told to. But we can see that following this rule would tend to under-illuminate tanks smaller than 50 liters, and provide more light than necessary for tanks larger than 500 liters, when compared to Amano’s tanks. It is unclear from whom the watts per unit volume rule originated, although Karen Randall, writing in Aquarium Fish Magazine, was an early proponent of it . But from a purely bio-physical standpoint, the Amano “watts per surface area” rule makes more sense. As I have discussed previously , the notion that deeper tanks need more light is largely a fallacy. This is because water-filled aquaria act as effective “light pipes” – think of them as big, square optical fibers. Aquaria therefore transfer light efficiently to their bottoms without significant “transmission loss” on the way down. Since volume is surface area times depth, and depth doesn’t matter (that much), lighting should be relegated to the aquarium based on its surface area and not its volume. Nevertheless, determining a tank’s surface area (either estimated or actual) takes more arithmetic than I can do in my head. And I suspect this is true for most people as well. The watts per unit volume rule is a lot easier to apply, since you buy tanks by their volume and lights by the watt and I can handle a simple division in my head. So I would still recommend using the rule 0.5 W/L to 1.0 W/L for moderate sized tanks, with the recognition that for smaller tanks less than 50 liters you may need more than that and for tanks larger than 500 liters you can get by with significantly less. It is clear from the above comparisons that tanks that use pet-store quality commercial hoods are severely under illuminated. But is it possible to over illuminate a tank? The evidence compiled by Eric would indicate that it is not possible to over-illuminate a tank unless you want to spend big bucks in an attempt to do so…you simply can’t do it economically and so aren’t likely to do it accidentally. The budget minded aquarist will likely illuminate a tank using dual bulb, four-foot fluorescent strip lights. These fixtures hold two 40-watt fluorescent tubes and are four feet long and five inches wide. The “watts per actual surface area” of this fixture is therefore 516 W/m2. So even if you completely cover the surface of an aquarium with strip lights you will still be only in the high-middle of the range of illumination of Amano tanks. To get more light than that it would be necessary to purchase VHO fluorescent or metal halide lighting; the expense of which makes its unlikely that you’d purchase so many as to cause a problem. The measured illumination of my tank is 16000 lux . To approach the illumination of the noon sun (100000 lux) I would have to increase the wattage by a factor of six, or supply my tank with a whopping 1800 watts of power! But would not a tank with these greater light levels be overrun with algae? Algae growth can not be eliminated in tanks with abundant light, but it can be reduced by controlling the concentration of dissolved nutrients in the water. Fish populations must be kept very low, feedings light, and an abundance of algae eating fishes should be present. But nutrients must be supplied to the plant roots, so iron-rich additives (such as laterite) are commonly placed in the gravel . And because actively growing plants can easily strip the water of all the CO2 they require for photosynthesis, CO2 injection is often used as well . And for the real high tech aficionados, one can add “undergravel heating” to keep the substrate healthy and as warm as the water above . All these techniques are intended to provide the plant with the nutrients required to make use of the light, while at the same time denying them to the algae. So how well does all this work? My own experiences are as follows. My plant tank has moderate CO2 injection, and some laterite in the Sil 9 gravel. I am aware that both the dosage of CO2 and the quantity of laterite are below optimal. And the water, being Calgary tap water, is harder and more alkaline than I would like. The tank receives a chelated iron and potassium fertilizer with every weekly water change of 30%. The tank is filtered by a plant filter that is populated predominately by Nomophila stricta. No substrate heating is used, but the tank bottom is well insulated so heat loss through the bottom should be negligible. As mentioned, the tank has a capacity of 450 liters and the filter has a capacity of 170 liters, and they receive 300W and 220W of fluorescent lighting, respectively. Nitrate, nitrite, and ammonia levels are all immeasurably low with my hobbyist-quality test kits. Algae growth is negligible on the plants, but there is still some algae growing on the glass. Most of the plant species, particularly Ludwigia repens and Valisneria spiralis, are growing exceptionally well, and have to be trimmed regularly. The sword plants (Echinodorus osiris and Echinodorus bleheri) are doing less well, despite a brief flowering soon after they were planted. I attribute their initial growth burst to the ability of the plants to make use of nutrients in their (now exhausted) corms, and the subsequent slow down to a lack of nutrients in the gravel. Hopefully they’ll pick up again as fish detritus builds up in the gravel. But despite my only qualified success so far, it can be easily seen from Amano’s and the Internet gang’s published photographs that incredible success can be achieved with these high illumination levels when all the other factors are just right. Takashi Amano, Nature Aquarium World Volumes 1-3, TFH Publications. Wlad Franco-Valias 1998, Water Circulation in the Substrate, in The Calquarium, Volume 41, Number 2, Page 25 ? Published in Lighting on April 1, 2000 and written by Grant Gussie. A useful rule of thumb is that for a planted freshwater aquarium of one of the standard dimensions the minimum amount of lighting required is 0.5 watts of fluorescent tubes per every liter of tank capacity. Because of the lower efficiency of halogen and incandescent lights, this corresponds to about 1.5 watts per liter of halogen lighting, or 2 watts per liter of incandescent lighting. Marine tanks with common sea anemones need about this much light as well, but tanks that maintain stony corals require double this amount. Remember that these are minimum values. We measure the intensity of light in various ways, but ultimately, the important factor is light flux of visible radiation (measured in lumens) per unit surface area (measured in square meters). This value is called “illuminance”, measured in lux. One lux is one lumen per square meter. There is also something called “irradiance”. This is radiant power (expressed in watts) per unit surface area. It can also be expressed as number of photons travelling through a square meter per second, or rather, Einsteins per square meter per second, where an Einstein is a mole of photons. Sometimes you’ll see irradiance and illuminance used almost interchangeably, but irradiance includes the spectrally useless infrared and ultraviolet radiation, not just the visible stuff, so be careful how you use these terms. But if you are talking about a solar type spectrum, the practical differences between the two is minimal, since almost all of the Sun’s light is visible. Here’s a way you can estimate the illuminance of your aquarium hood. All you need is a 35mm camera with a built-in light meter, or more specifically, one of the “older” 35mm cameras that doesn’t do everything for you. You have to be able to manually set the shutter speed, film speed, and the f-stops. Assuming a reflector efficiency of about 70%, we find that the surface should receive about 13000 lux. For the record, I found the light in my tank to be 16000 lux. The noon equatorial sun, on the other hand, creates almost 100,000 lux. It is therefore evident that even our apparently well-lit tanks are much dimmer than natural waters, and it is only the adaptability of plant species that allows them to grow in our aquaria at all. However, the measured lux and lumens of an aquarium lighting system are misleading. As discussed last month, the eye is most sensitive to yellow and green light while plants absorb most efficiently red and blue light. The lumen rating relates to eye sensitivity, not chlorophyll absorption, so you can have a high lumen rating but still have little light usable by plants, which is the case if you use cool whit fluorescent tubes exclusively. You may have wondered why I chose the two seemingly inefficient 1000 lumen “grow and show” bulbs when the daylight tube are rated for three times their brightness. But the grow and show bulbs are designed to match (as well as economically possible) the absorption spectrum of chlorophyll, and thus produce a lot of red and blue light but comparatively little green light. They therefore produce a lot of “photosythetically available radiation” (PAR), and also help bring out the red and blue colors of the fish a little better. It would be nice if manufacturers also listed their bulbs’ PAR output as well as their lumen output. PAR meters are available from scientific supply firms but there is no economically feasible way for an aquarist to measure his tanks’ PAR. It is often written in aquarium literature that light follows the inverse square law, so that if you double the distance from the bulb you decrease the intensity of light by a factor of four. Not for any real light source anyway. It only holds true for a point-source of light that radiates light in all directions equally. If you direct the beam with a reflector, or if you build a light that is not infinitesimally small, the inverse square law does not apply. In fact, if you are less than one tube length away from the middle of a fluorescent tube, light drops off at an approximately linear rate. That is, if you are two feet away from a 4-foot tube, you receive half (not one quarter) the light that you would receive if you are just one foot away. And if you are in front of the middle of a whole bank of six or more fluorescent tubes, the light intensity at two feet away is almost the same as it is only one foot away! Especially if the bank of lights is in front of a flat reflector. I won’t bother going into the proof of this (it requires some second year calculus) but think about it for a while and you will realize that as you move away from the center of the reflector, you receive more light from the sides, and this compensates for the increasing distance. This works as long as you are still closer to the center of the reflector than the reflector is wide. So a multiple tube fluorescent light fixture (with a flat reflector) produces a very even light throughout the depth of a tank. If you want to defeat the inverse square law, get more tubes. Another way to defeat the inverse square law is with a curved reflector. A curved reflector can reflect the light from the bulb as parallel rays. The best shape for this is a parabolic reflector, like the ones used in searchlights. They produce a parallel light beam that does not dim appreciably with distance, giving lights equipped with parabolic reflectors a very long range. Parabolic reflectors are also used in aquaria, mostly with metal halide bulbs. Such a combination produces an intense light, but unfortunately the light doesn’t spread over the tank bottom very evenly. So a modified parabolic reflector is often used instead, so that the light does spread enough to cover the bottom but not so much that it gets wasted. Another affect is also important in getting light to the bottom of deep tanks, and that is total internal reflection. Water is considerably denser than air and also has a higher “index of refraction”. This means that a light ray is bent (refracted) when it crosses from water to air. Total internal reflection occurs when a light ray travels from water to air at such a shallow angle that the ray is bent back away from the air, that is, it is reflected. This effect is what allows light to follow a fiber optic cable as it twists and turns. It also traps light in an aquarium. The light travels down through the aquarium from the lights above, but, unless the light is a perfectly parallel beam from a parabolic reflector, the light also spreads out so that it hits the sides of the aquarium. But this spreading angle is low enough that the light undergoes total internal reflection at the vertical sides of the aquarium. To see this affect, look at a table next to an empty aquarium that has an operating light fixture. Note how brightly lit the table is next to the tank. Then fill the tank with clear water, and note how much dimmer the table is, and, more importantly, how much brighter the bottom of the aquarium is. However, real aquaria invariably gather algae and other assorted crud on the tank walls, so that rather than reflecting the light back into the water, the tank walls simply absorb the light. If you want to maximize the light levels in your tank, keep the walls shiny and clean. The one thing that struck me on my last trip to the Vancouver Aquarium was the ripple lines on their tank bottoms. These moving bands of light and shadow are quite natural looking (anyone who has ever snorkeled over a sandy bottom is thoroughly familiar with them) but they are rarely seen in home aquaria. They can however be created by using a compact light source (such as a metal halide light), a parabolic reflector, and a small wave generator. The parabolic reflector creates parallel light rays, just like the Sun’s rays. These are focused/defocused by the wave ridges and troughs made by the wave generator, creating the moving bands of light and shadow. There has been speculation that photosynthetic corals and clams may need ripple lines and their bursts of super-bright light in order to thrive. As of yet, I’ve seen no presented evidence of this. And given that ripple lines are never seen in water more than a few meters deep, the presence of corals and giant clams at depths of > 10m would make such a hypothesis dubious. All in all, ripple lines are probably just a very nice visual effect, but they are expensive to achieve in the home aquarium. Myth: The inverse square law applies to aquarium lights. Fact: Only the light from a compact bulb with no reflector drops off as per the inverse square law. The illuminance of a single (or dual) fluorescent fixture drops of approximately linearly with distance. And the illuminance of a multi-tube fluorescent fixture is almost independent of distance. Furthermore, the light from a compact bulb in a parabolic reflector is nearly independent of distance as well. Myth 2: Deeper tanks need more lights. Fact: An aquarium with lights over its surface is effectively a light pipe. Just as light will travel through a fiber optic cable without losing intensity, light will travel through an aquarium with clear water and shiny sides without dimming. Only the absorbing effects of algae on the aquarium walls, objects within an aquarium, and the less than perfect clarity of the water cause the light to dim with distance. So what is the very best lighting for your planted fresh water tank? If money is no object, get a metal halide light with a daylight (5500K) bulb. Use one 200-watt fixture for every 4 square feet of tank surface. The total cost of the two fixtures needed to light a 4’ x 2’ x 2’ tank is about $600. The cost of the metal reflector (and metal is required because of the heat generated) is about $150. The cost of the two daylight bulbs is $240. Total cost: about a thousand bucks. But all these items can be purchased (usually from stock) from any of the local hydroponics stores. This system provides light at a rate of a little less than 1 watt per liter. And if you are really splurging, replace the $150 reflector with mirrored parabolic reflectors and add a wave generator to get a pleasing ripple line effect. Now back to reality: money is an object. Some compromises in performance are required to bring the price down to reality, but an adequate system is still achievable at a much lower cost. Use one 4-foot dual-bulb fluorescent fixture (cost $24) for every 20cm of tank width. Use a mixture of 40-watt General Electric Ultra-Daylight and 40-watt General Electric Gro & Sho plant bulbs, mixed at a ratio of two daylights for every plant bulb. The cost of the three fixtures required to light a 4’ x 2’ x 2’ tank is $72. The cost of the reflector (which can be wood lined with aluminum foil) is about $30 if you make it yourself. The cost of the six bulbs is $52. The total cost is about $160. And all the required items are available at Revy or Home Depot from stock. This system provides light at a rate of a little more than 0.5 watts per liter, and is the set up I use on my own 4’ x 2’ x 2’ tank. To lower the cost of this system further, replace the tubes with common cool white fluorescent tubes costing a couple of bucks each. Despite all you may read, the many beautiful plants grown under these lights have proven long ago that they are completely adequate. Be aware however that they are not as effective at growing plants as their apparent brightness would indicate, because they produce little red and blue light. The future in aquarium lighting probably lies in the next generation of HID lamps. OSRAM and various luxury car manufacturers have developed a HID automobile headlight. Some tricky electronics was required to get rid of both the inordinately long “warm up” time and the hot starting problem of HID lights (since headlights have to click on instantly, hot or cold), as well as the waste heat problem. If this ballast technology trickles down to everyday uses, we won’t want to use anything else. If however power compact fluorescent lighting becomes significantly cheaper, these lights will overtake the market as the aquarium lighting system of choice. Exotics such as the sulfur lamp are unlikely to come into their own for at least another decade. The discussion of aquarium lighting in the typical hobbyist book is cursory, and often used to simply promote the completely inadequate aquarium hoods and lights sold by domestic pet industry manufacturers. The CAS library book The Optimum Aquarium (Horst and Kipper, 1986), does however discuss lighting in more detail, and is by far the best source of lighting information for fresh water tanks. Unfortunately it is biased toward promoting the very high quality, but obscenely priced, Dupla line of products. The best source of non-commercially biased aquarium lighting information is the Internet. Eric Olson’s web site, The Krib, contains a list of frequently-asked lighting-related questions at http://www.thekrib.com/Lights/faq.html. It also contains an archive of the lighting discussion that floated through the plant email list and the *.aquaria newsgroups in the mid 1990’s (http://www.thekrib.com/Lights/). Or you can out George Booth’s page http://www.frii.com/~booth/AquaticConcepts/Lights/ for much of the same material (with some better editing) that’s archived in The Krib, as well as a thorough basic discussion of lighting in planted freshwater tanks. I do however believe that George’s claim that “A metal halide bulb is 2X as bright as the same wattage fluorescent bulb” is in error, as the most efficient small source of broad spectrum light are the new-generation triphosphor fluorescent tubes. Another good source of aquarium lighting information is the monthly electronic magazine Aquarium Frontiers, located at http://www.aquariumfrontiers.com/default.asp. Don Klipstein’s Lighting Info Site! at http://www.misty.com/~don/light.html is a good place for general lighting technology information. , at http://www.intl-light.com/handbook/ contains a more physics orientated look at artificial light sources.? Published in Lighting on May 1, 1999 and written by Grant Gussie. In this series of articles, I would like to introduce the theoretical and practical aspects of light in the aquarium. How much do you need? Of what kind? From what source? But first, a more fundamental question. Actually, we don’t know. It’s “sort of” an electromagnetic wave, i.e., an oscillating change in an electromagnetic field. Actually, we don’t know that either. Well, so are a lot of university physics majors, who aren’t let in on science’s “dirty little secret” – that we don’t really know what light, electrons, protons, people, and mongooses actually are – until their first quantum mechanics course, usually in their fourth year of studies. We have very good theories that tell us how these things (or at least the first three) behave, but there is no understanding of what they are. Light has associated with it a property called “wavelength”. Since light really isn’t a wave, the wavelength of light isn’t what you picture when you see, for example, a water wave, but it is both useful and traditional to think of light as a wave, and so we call that property (whatever it actually is) “wavelength”. The shorter the wavelength of light the more energy it carries. But a real light beam is made up of light with a range of different wavelengths. The intensity of the light at a given wavelength might be different than that at another wavelength. How the intensity changes with wavelength is the light’s spectrum. Our eyes react to light that has a wavelength between 0.4 m m and 0.7 m m. Furthermore, we perceive light with different wavelengths within that range as different colors: the longest wavelengths are red, then as wavelengths get shorter you progress through all of the colors of the rainbow to violet. Green plants also react to light with about the same spectral range, but in their case they use a light sensitive pigment to absorb the light, usually a type of chlorophyll. Chlorophyll absorbs light most strongly at the red and blue ends of the spectrum, and is less efficient at absorbing light that is yellow or green. Because the green light that is not absorbed is reflected, green plants look green. So why do both our eyes and green plants react to (more or less) the same wavelengths of light? Its because that’s the light we have the most of. Our major source of light is the Sun. The Sun is a ball of hot gas, and its surface has a temperature of about 5500K. Such a hot object radiates away energy in the form of light, with the most intense light being in the wavelength range 0.2 m m and 0.8 m m. But the light with wavelengths shorter than 0.3 m m gets filtered out by the Earth’s atmosphere, and wavelengths longer than 0.7 m m carries comparatively little energy, so the useful radiation that reaches the ground is mostly between 0.3 m m and 0.7 m m: almost exactly what our eyes can see. The spectrum of light produced by hot object depends on that object’s temperature. For example, the Sun, at a temperature of 5500K, produces a spectrum that your eyes see as “white” light. That is, when your eyes see that particular mix of red-through-violet light, your brain combines the colors so that you perceive the color white. But an incandescent light bulb has a tungsten filament with a temperature of only about 2600K (depending on the wattage), which is considerably cooler than the Sun. So an incandescent light bulb does not produce nearly as much high-energy short-wavelength blue and violet light as the Sun does. Incandescent lights therefore look yellowish to human eyes. We say that incandescent lights have a lower color temperature than sunlight, because it is produced by a radiating object with a lower temperature, and thus has a different (yellower) color. Halogen lights differ from simple incandescent lights in that they have their tungsten wire encased in a high-pressure gas with traces of a halogen (usually iodine). The purpose of this halogen is to return evaporated tungsten to the filament. After tungsten evaporates from the filament, it condenses on the inner surface of the bulb. The halogen gas in the bulb reacts with this thin, warm tungsten deposit to produce tungsten halides, which evaporate fairly easily. When the tungsten halide gas reaches the filament, the intense heat of the filament causes the halide to break down, releasing tungsten back to the filament. This increases the lifetime of the tungsten filament and allows it to operate at a much higher temperature. Thus light with a higher color temperature can be created by halogen lights than by ordinary incandescent lights. The color temperature of halogen lights is about 3500K. They also are about 20% more efficient than normal incandescent lights and last about three times longer. There are advantages and disadvantages to using incandescent lighting in aquaria; and in a sense the same advantages and disadvantages exist for halogen lighting, except that both the advantages and disadvantages are more pronounced in halogen lighting. The biggest advantage, and this is a very big advantage, is that they are both very inexpensive. The incandescent/halogen fixtures can be purchased and easily hand wired for a pittance when compared with other forms of lighting. The bulbs themselves are also relatively inexpensive. Normal incandescent bulbs can be purchased for about a dollar per globe if you shop around and buy in larger numbers. Halogen lights cost about $8 but are still economical when compared to incandescent lights given their greater longevity and intensity. Another major advantage is that the lights are very compact, and many of them can be placed over an aquarium. Very high light intensities can therefore be achieved. The primary disadvantage of halogen or incandescent lights is their inefficiency. Most of their monstrous power consumption goes into creating waste heat, and this can cause serious problems in the aquarium. They also produce a yellowish light that does not show fish colors to best advantage. Freshwater plants, however, do well under these lights (provided the intensity is adequate) as their spectrum matches well the red peak of chlorophyll’s absorption spectrum. Fluorescent lights do not produce light by simply heating an object until it glows, as do incandescent and halogen lights, but instead they are a little more complicated. They produce light by subjecting a gas to a very high-voltage electric field, which excites the electrons in the gas’ atoms, so that they are in high-energy state. But the electrons will also (spontaneously) jump back down to a lower energy state, and do so by releasing energy in the form of light. But the jump between energy levels is very discrete, as each energy level has a very specific energy. The light released therefore has a specific energy too…and thus a very specific wavelength. In neon lights, for example, the light released has a specific wavelength in the red region, which is why neon lights are red. Other gasses produce other colors: for example blue “neon” lights are actually full of argon. The mercury/argon gas in fluorescent lights, however, glows in the ultraviolet, which human eyes can not see. What happens next is that the ultraviolet light is absorbed by the phosphor paste on the inside of the tube. This phosphor produces a secondary glow in visible light in response to the energy of the ultraviolet light. Fluorescent lights require more voltage than the 110 volts of your AC outlet, so they incorporate within them a transformer that boots the voltage to a high enough level. This transformer is called, for reasons I can not fathom, a ballast. In typical fluorescent light fixtures this is a black metal brick about 20cm long. These iron ballasts a “simple” transformers that use wire-wrapped iron core to step up the voltage. They themselves consume up to 16 watts of power (converting it into heat) so fluorescent lights aren’t quite as efficient as they could be: a fixture with two 40-watt fluorescent tubes actually consumes 96 watts of power rather than 80. But there are also electronic transformers that do the job much more efficiently and run much cooler. They also have the added advantage of eliminating the 60-Hertz flicker of fluorescent lights, as they operate at about 20000Hz (far faster than anything your eye could ever perceive). There is also a 10% to 15% increase in light output caused by their shorter cycle time. They also greatly extend tube life. And with electronic ballasts in place fluorescent lights become dimmable. But electronic ballasts cost big bucks…I found prices that ranged for $75 to $270 for electronic ballasts that can handle two four-foot, 40-watt tubes. Neither does anyone seem to stock these ballasts locally, so they must be mail ordered. Fluorescent tube manufactures have invested a lot of time and money developing mixes of phosphors that produce different kinds of light spectra: some can mimic the spectrum of sunlight very well. We can therefore say that a fluorescent light has a color temperature too, even if that color is only reproduced artificially (there is nothing inside the tube that is actually heated to that temperature). Your typical “cool-white” fluorescent tube has a color temperature of around 4100K, while a warm-white tube has a color temperature of around 3400K. This means that the light they produce has a spectrum that is most similar to a glowing hot objects of temperature 4100K and 3400K, respectively. Note that “warm-white” tubes have a lower color temperature than “cool-white” tubes. That is because we call yellow, orange, and red “warm” colors because of their association with fire and sunsets, while blue is a cool color because of its association with the sky and the sea. The yellower light of the warm-white tube is therefore thought of as “warmer” than the bluer light of a cool-white tube. But a hotter object produces light with more blue than a cooler object, and so a bluer light has a higher color temperature. Unfortunately, warm white and cool white tubes do not recreate the spectrum of sunlight very well. They produce far too much green light, which your eye is most sensitive to, but little red or blue light, which plants are most adept at using. So although they look bright, they produce comparatively little light that is usable by plants. If you use these lights, you will need more of them to produce the same plant growth than tubes that reproduce a solar spectrum more accurately. A daylight fluorescent tube has a more advanced (and thus expensive) “rare-earth” phosphor mix than either the warm or cool white tubes. These phosphors mimic the 5500K spectrum of sunlight quite well. Daylight fluorescent tubes typically cost about $8 at Revy and other home-building supply stores. Daylight tubes are also available that have very advanced “triphosphor” compound that produces more light per watt of consumed electricity than the dual-phosphor coatings in regular fluorescent tubes. And they also have a very good color-rendering index (CRI). The CRI is a measure of how natural colors appear under the light. A perfect score of 100 means that a special multi-color card looks the same under the light as it does under “high noon” sunlight. Triphosphor daylight fluorescent lights typically have a CRI of better than 90. Unfortunately, triphosphor tubes are only locally available from stock at pet stores, where they sell those made by Coral Life and a few others. The cost for such tubes is prohibitive, at about $45 for the four-foot size. However, a tube that is essentially identical to the wallet-busting pet shop lights is the Philips Ultralume 50. I don’t imagine you’ll find anyone who has this tube in stock, but you can order it from industrial lighting stores, such as Litemor, in lots of 10 for $8.50 per tube, or in lots of 30 for $7.50 per tube. These lights are about the same price as the dual-phosphor daylight tubes sold at Revy, and you get a much better tube, but the need for a bulk special order requires a much larger single outlay of cash. Those pinkish aquarium and plant “grow and show” tubes have phosphors that produce a spectrum that closely mimics the absorption spectrum of chlorophyll. They therefore produce a lot of “photosythetically available radiation” (PAR) per watt of consumed electricity. Unlike a daylight tube, which has a spectrum with a broad peak of intensity centered in the yellow-green, a plant tube’s spectrum has two peaks, one centered in the blue and the other in the red. There is a dip in intensity in the yellow and green, since chlorophyll does not absorb green very well. This enhanced blue and red helps bring out the color in your fishes, but this color enhancement is unnatural. No colors look particularly natural under these lights, as their odd spectrum gives them a near-zero CRI. And, because the dual-peak spectrum is nothing like that produced by a glowing hot body, these lights really can’t be given a meaningful color temperature. Also available are actinic tubes, which have spectra that are very enhanced at the blue end. These tubes are used in saltwater aquaria because the mimic the light seen under the sea. Because water absorbs red and yellow light much better than blue light, the light more than a few meters down in the ocean (if the water is clear) is quite blue. Photosynthetic organisms from coral reefs are used to such light, and do better with an enhanced blue spectrum. But few freshwater aquarium residents, with the possible exception of the open-water East African lake species, live under such blue-enhanced light, so actinic tubes are of little use in freshwater tanks. The color temperature of these lights is very high, as much as 30000K, but their CRI is abysmally low. In the past, a normal fluorescent tube consumed 10 watts of electricity per foot of length. So the four-foot length consumed 40 watts. But the standard of 10 watts per foot was thrown out the window in 1996, at least in the case of cool-white tubes, which must now be 34 watts in the four-foot size. Thankfully, these regulations do not apply to “high quality” tubes such as daylight tubes (with a minimum CRI of 69), or special purpose tubes, such as plant tubes. The standard four-foot tube you will soon see will also be smaller in diameter than the current lot, 1 inch rather than the current 1½ inches. Most fluorescent tubes are nowadays of the T12 variety, where the number 12 refers to the tube diameter in eighths of an inch. But the industry is moving toward T8 varieties, which can fortunately use the same iron ballasts and hook to the same connection points as are in the current standard fixtures, and they also produce the same amount of light for the same wattage. But I’m told by a local commercial light supplier that the industry standard four-foot fluorescent light fixture will soon have a 32-watt T8 powered by an electronic ballast. And these new-generation electronic ballasts are unable to operate the current-generation 40-watt T12 tube (Aarrrgggh!). Light output from an electronic-ballast 32-watt T8 fixture is only slightly lower than that of a current 40-watt T12: the 20% decrease in wattage is offset somewhat by the 10% to 15% increase in light output provided by the electronic ballast. But a simple switch in a current fluorescent fixture from a 40-watt T12 tube to a 32-watt T8 tube results in a full 20% loss of light output if the fixture’s iron ballast is not upgraded to the new electronic variety. The technology exists in the new triphosphor fluorescent lights to create a fluorescent tube that is not only more efficient but one that produces a much more natural light. Hopefully, the move to reduced tube wattage will be accompanied with an increase in the availability of triphosphor tubes to restore our lost illumination. Compact fluorescent lights are intended as an energy-wise replacement for incandescent lights. They consist of an electronic ballast unit which screws directly into a normal incandescent light socket, and the tube itself. The tube is looped into a U shape so that both sets of connector pins can connect to the same ballast connector socket. Since fluorescent lights are about four times more energy efficient and last 10 times longer than an incandescent bulb, the relatively high initial cost of these lights (about $16, with replacement tubes being about $6), are offset by their low operating cost. As of yet, compact fluorescent lights are only readily available in the “warm-white” and “cool-white” colors. Nevertheless, they are great for an inexpensive and energy efficient refit of all your old incandescent aquarium hoods. In addition to the compact fluorescent lights that are intended to replace household incandescent lights, there have also been introduced high-output compact fluorescent lights for business lighting applications. Although these lights are slightly less efficient than long fluorescent tubes, they are perfect for aquaria, providing intense lighting with excellent spectral characteristics. These systems are however very expensive. Mail order sources have been selling these units for reef aquarium use, but they are not price competitive with metal halide systems (discussed below). Mail order price for a 192-watt unit carries a mail order price of about $1000, or double what local hydroponics stores ask for a 400-watt metal halide system. One aquarium manufacturer has recently introduced the OSRAM power compact fluorescent light in a “regular line” aquarium hood. These lights are however still expensive (about $190 mail order for the 2 x 55-watt, 4-foot size) and they have yet to arrive in local shops. These fixtures are not readily available for the do-it-yourselfer to wire together, as they are a specialty building item that has yet to show up at Revy. They can however be ordered from industrial lighting supply stores: the most commonly available example is the Philips PL-L 40-watt compact fluorescent light, but you may be hard pressed to find it listed in anything but the typical warm-white or cool white colors (it is available in daylight as well). The cool-white tube costs about $18, and the parts for the fixture and ballast cost about $85. But for the extra cost over regular fluorescent lights, these lights offer no advantage besides a smaller size, and thus the ability to stuff more of them over the aquarium for more intense lighting. High output and super high output fluorescent light look like the normal long-tube variety but they have a wattage double or triple that of a normal tube of the same length. But they are less efficient than normal tubes, so they do not produce as much light per watt. Nor do they last nearly as long as normal tubes. And they require very expensive electronic ballasts rather than the mass-produced and available-at-every-hardware-store iron variety. And I have never seen HO or SHO lights for sale locally, and the industrial lighting stores I have approached do not even have them listed for order, so you are looking at a mail order to one of the pet supply firms in order to get them. Figure on $340 for the ballast and connectors to run four 4-foot tubes (110 W), plus $44 per tube. All this seems like far too much cash and hassle to be worth it, so I would forget about high output fluorescent lights. These lamps contain a mixture of gases including mercury, argon, and metal halide gases such as sodium iodide, strontium iodide, and a few others (the exact mixture being a manufacturer’s secret). These gases fluoresce when subject to a strong electric field. In this respect they work like neon lights, but instead of producing a single pure color, they produce a broad spectrum. They can also be made to produce a sun-like spectrum with a near perfect CRI and a color temperature of around 5500K. Such “daylight” metal halide lights do however come at a premium price, and most general-purpose metal halide lights have a color temperature only about 4300K. The current generation of metal halide lights are extremely expensive, starting at about $300 per operating fixture, plus $40 for the cheapest possible bulb (4300K), or $120 for a daylight bulb (5500K). And that is for a unit with just an inefficient iron ballast: double the price for one equipped with an electronic ballast. An iron-ballasted metal halide light requires a good 10 minutes to “warm up” before it reaches maximum light output. And if it is turned off while fully warmed up, it must be allowed to cool completely before the power is restored, or else it will not start again. So a brief power outage while you are at work will leave your aquarium dark all day. The smallest size of metal halide bulb that is locally available is 400 watts. This is actually a little more power than you are likely to want for a planted freshwater aquarium unless your tank is enormous, since a single 400-watt bulb, although not outsized for a 400-liter or larger tank, won’t light the corners of such a tank very well…you really want two 200-watt bulbs for a 400-liter tank. But you can’t find these locally, and so you are back to making a special order. And even if you did order them, the cost would be the same per unit as the 400-watt unit: about $300. So you are looking at $600 for just the fixtures needed to light your 400-liter tank. Ouch. Well, its still better than the $2000 a commercial metal halide aquarium hood would set you back I suppose. I am also not impressed with the reliability of the metal halide I purchased, as it shorted out and fried itself twice in three years. And its iron ballast ran very hot…so hot that you would burn yourself by touching its metal case. I was never convinced that I hadn’t purchased a fire waiting to happen. But the advantage of metal halide lights is great: they produce a concentrated light source from a small bulb, unlike the diffuse light of a much larger fluorescent tube, so very much higher light intensities can be achieved. They are about as efficient as fluorescent tubes and they last almost as long as fluorescent tubes. Metal halides are still the only way to go when it comes to reef aquarium lighting, as they are the only readily-available lights that produce a daylight spectrum and are compact enough that you can fit enough of them over an aquarium to give you the required light intensity. Traditionally, metal halide lights over reef aquaria are supplemented by blue actinic fluorescent tubes to reproduce the blue-enhanced color of sub-marine light. This will soon be unnecessary as high color temperature metal halide bulbs (color temperature of 20000K) are already getting onto the market. In the future, we may be able to choose between one of several high intensity, high efficiency lighting sources that are already seeing development. Foremost of these is the sulfur lamp, which uses radio frequencies to stimulate a sulfur-argon gas to radiate visible light. These lights have proven to be about 20% more efficient than fluorescent lighting, while generating practically no heat or ultraviolet. Bulb life is an incredible five years. The color temperature is a good 5200K, but the CRI is a relatively low 79. These units are as yet only available in a gigantic 5900-watt size (for about $2500) which may be fine for the midnight pharmaceutical herb growers, but aquarists would be hard pressed to make use of this much power. Smaller units are however under development, and if they prove to be price competitive with existing lights and as efficient as the 5900-watt unit, they will set the standard for all aquarium lighting. ? Published in Lighting on April 1, 1999 and written by Grant Gussie.